Beazer Homes has purchased over 30 existing lots and will begin construction of homes in Parks at Prestwick in Avon, Indiana. Beazer will be building their Palladium Collection of homes, which offers higher end finishes with a semi custom look and feel. Their homes feature many floor plan options for customizing your home to fit your lifestyle. The model shown is a Wakefield model, boasting 3100 square feet of living space on the upper and lower levels with formal living and dining room, large family room with a beautiful wall of windows overlooking your back yard. Also included is a gourmet kitchen with eat-in breakfast room. A popular feature of this model is the master bedroom on the main level. Having owned a master on the main home when my children were young, I really like the fact this home does not have another room above the master. No pitter patter of little feet pounding through the ceiling. 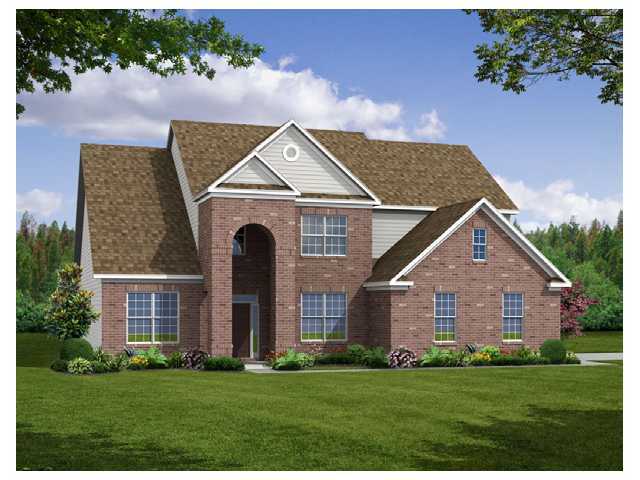 Additional features of the Wakefield model include 3 additional bedrooms upstairs, a loft and office. You have the option for additional bedrooms, baths and a huge bonus room, as well. If you need more space, finish off the basement for an additional1900 square feet and you have a beautiful home, customized the way you want it. In this particular model, you can have up to 6 bedrooms and 5 bathrooms in just the upper and main level. Beazer Homes are eSmart Energy Star homes, which offers savings in the cost of energy, water and maintenace of your home. There are five models in the Palladium Collection, ranging in size from 2400 square foot and starting at $299,000. Additional costs could include design center options, interior and exterior building options, as well as lot premiums. The Palladium Collection of homes from Beazer are also available at Highland Green in Brownsburg and Lochaven in Noblesville. Parks at Prestwick is a wonderful community of custom and semi-custom homes. Community amenities include a neighborhood pool, park and basketball court. You'll also enjoy the nature preserve, walking trails and beautiful wooded areas. Search available homes for sale in Parks at Prestiwck and view a community tour. It would be great if Beazer were to make 3 car, side load garages part of the base house here in Parks at Prestwick. That would ease a bit of the anxiety that is prevalent back in Devonshire. There are not any production homes currently in the parks at preswick. Production homes are the homes that beazer plans on building that will Lower the value of every single home in our neighborhood. A 3 car garage would not even start to impact the value beazer is stealing from every home owner in here. Beazer is using our equity to sell their 'semi custom homes' what a joke what makes them semi custom? A custom home does not come with options. It comes with unlimited choices. A car comes with options. A custom home does not show up on a truck and take two days to frame. Beazer is just exploiting a situation and has no concern for the residents of PaP.